On Feb 13th, Funny as Tech will explore: Why Is Tech So Lousy with Women?! at the Peoples Improv Theater (123 E. 24th Street)! 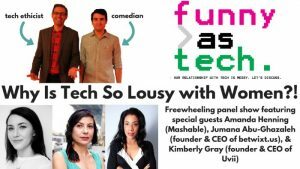 Special guests for this tech-comedy panel show include Amanda Henning (culture writer at Mashable), Jumana Abu-Ghazaleh (founder & CEO of betwixt.us), and Kimberly Gray (founder & CEO of Uvii). Funny as Tech is a live panel show and podcast that tackles the thorniest issues in technology. Co-hosted by tech ethicist David Ryan Polgar and comedian Joe Leonardo, Funny as Tech has featured guests including Douglas Rushkoff, Manoush Zomorodi, Chuck Nice, Nir Eyal, Bridget Carey, Baratunde Thurston, CNET’s Bridget Carey, Foursquare’s Dennis Crowley, and CNN’s Laurie Segall. Join us for this freewheeling panel show where the guests let loose. It is a wonky night out where you can both learn, laugh, and ask questions. There will also be a book giveaway (3 copies) of Douglas Rushkoff’s new book, Team Human. This event is being co-produced by the Ethical Tech Meetup.